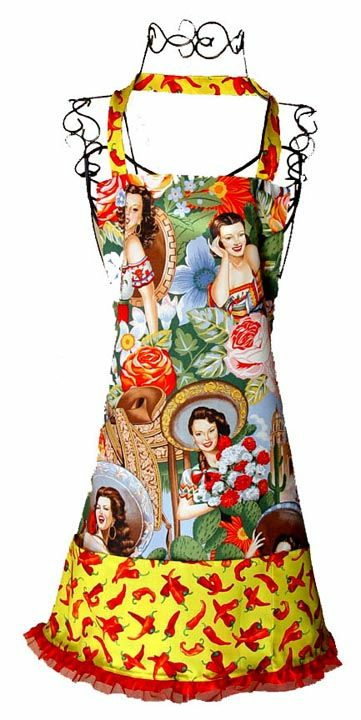 The Hot Calendar Girls apron features lovely, colorful senoritas from Mexican calendars of the 1940's. The coordinating fabric used for the neck strap, waist ties and across the lower part, has small red chilis on a yellow background. The 3 pocket bottom has a red ribbon and organza trim. Cocina aprons are all 100% washable cotton. One size fits most. Hand made in Mexico. Delantal con motivos Mexicanos de mujeres de calendario. Precioso lleno de s�mbolos mexicanos. Este delantal es encantador, los colores y la alegr de las chicas mexicanas denota un estampado bellimo, me recuerda a las pelulas de Dolores del R y de Mar Fix, los as dorados del cine mexicano. Me hace sentir muy bien cuando lo veo, me recuerda mucho las cosas lindas de mi pa natal. I bought this apron ...my daughter is in the army and she had to do a demontration speech..it was on green chile enchiladas..I wore my apron (i was her helper) I got so many compliments on this BEAUTIFUL apron! My daughter says mom you have to keep this forever.I told her its YOURS! . So I will be purchasing another one. This so is cute and bright! It is very well made with good quality fabric and nice detail. I received many compliments from my guests. EXCELLENT!! Wish I would have ordered more, and will do so. These are hot, hot, hot, and cute, cute, cute! Plus, for a real CHEF (COOK) having pockets is a real plus! RETRO ADORABLE!